Where's the Best Place for Pay: London, Paris, New York, Milan? London, Paris, New York, Milan: where's the best place for pay? Have you ever considered wrapping up your career in Paris? It might just be part of the perfect trajectory through finance, according to our latest numbers. With starting salaries in Paris of GBP 50,000 (USD 82,000) vs GBP 55,000 (USD 90,000) in London and up to GBP 75,000 (USD 123,000) in New York, our data points to the latter as the sweet spot to kick start a career in finance. Looking ahead at mid-ranking titles (VP/Directors), the curves invert in favour of London, with respective total comps of GBP 170,000 (USD 280,000)and GBP 285,000 (USD 470,000). While London strengthens its lead at MD level, we felt that factoring in the quality of life, cheap schools etc.. in Paris would probably even out the differences, making the French capital a cushy haven for a last career move with long lunches and patisseries galore, time dig out your GSCE French handbook. 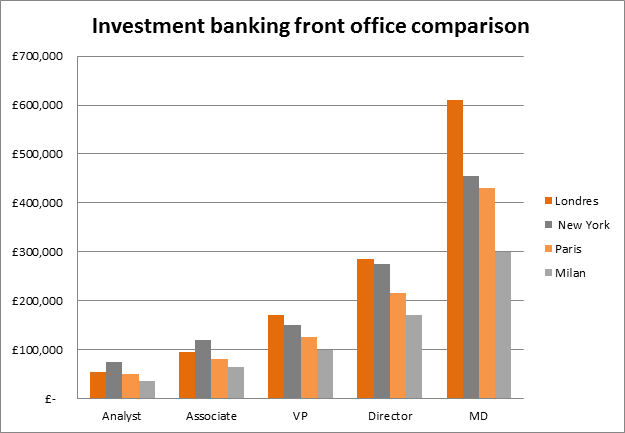 Investment banking is a truly global industry with careers often involving moves across continents. From a purely financial viewpoint it would appear that moving west to east (NY London Paris) would give the optimal return, and a nice place to settle down in retirement!